For this week's Toolbox Tuesday we're going to take a slightly different approach. Rather than cover a specific tool in my collection, I'm going to cover a specific product that I would quite honestly be lost without. 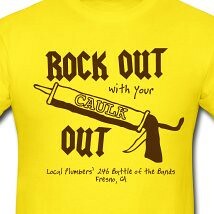 The product that I'm speaking of and attribute many of my home improvement successes to is...caulk. I know, this doesn't particularly strike many people as a "tool," but it is something that I often keep in my tool box, or at least close at hand. Besides, I'm not talking about just any caulk, I'm talking about a specific brand of latex caulk that I'd be up DIY creek if I didn't have. I'm talking about Sashco Sealants' "Big Stretch Caulk." When you live in a house that has settled so much that there isn't a 90 degree angle to be found, a house with walls and ceilings so crooked, wavy, and cracked that you can't make a good tight miter joint to save your life, you need a good quality caulk to fill those voids to make your amateur joints look professional. After working all day on installing crown on the various intricate and slightly off angles and slightly curved wall, the following conversation took place. Wendy: How's the crown molding going? Alex: Just finished nailing it in place. Haven't caulked or painted yet. What do you think? Wendy: Really? Hmm...maybe we should have hired someone? At this point in the project, Wendy hadn't seen the magical miracles that caulk can work. Not knowing the difference in caulk brands, I picked up a standard "White Latex Caulk" from Home Depot. I applied the caulk, and within hours Wendy was back on the DIY train. She had a little hesitation there at first, but all was good. 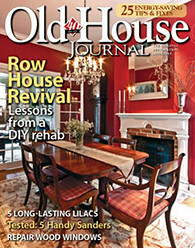 That is until about eight months later when we noticed that the caulk we had applied and painted in the living room and entry hallway had separated from the wall or ceiling in places, and had begun cracking along the majority of the molding. Thus began my love/hate relationship with caulk. 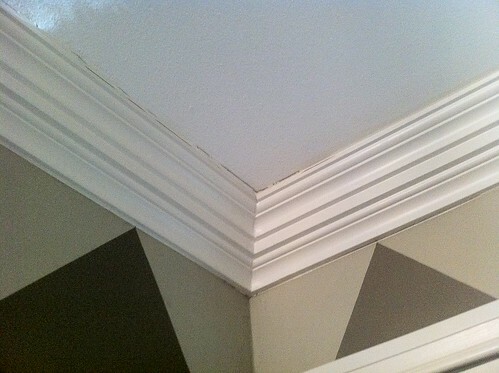 If you own a house with crown molding, there is a good chance you've seen these cracks at the base or top of your crown. I've seen it on DIY jobs, professional and newly constructed houses, and houses that had just had a high end renovation completed by a reputable contractor. To me, this is simply not acceptable performance for a finishing product. I put a good deal of time and effort into doing a project the right way, and the last thing I want is for the finishing element of the project to fail within a year of install, making it look amateurish. During one trip to a local paint supply store (the only one in the are that sold Benjamin Moore paint at the time) we were waiting for a gallon of our paint to get mixed up. There was a small product display sitting on a table that showed the amazing performance of the product. I didn't realize it at the time, but I was looking at something that would make me fall back in love with caulk. The product was called "Big Stretch," and it showed that a single but thick bead of this particular latex caulk would bind securely to either surface and would stretch up to two full inches before beginning to crack or break free. Skeptical, I looked up a few reviews online and the pitch was confirmed. This caulk is more expensive than the other stuff, but would be well worth the extra cost given the promised extended life, so I bought a few tubes for our next crown project. Since that fateful day, I've not looked back. We've used this caulk in almost every situation that calls for latex caulk. This includes all crown molding, baseboard, or other molding surface installs, our siding install, and various other useful applications for the Big Stretch. 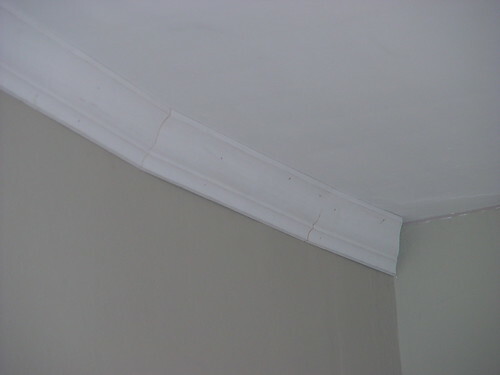 It has worked flawlessly since we first installed it on our dining room crown molding. The dining room crown was installed in October 2004 and is still crack free almost seven years later. Typically, to save cost, we buy a case of caulk at a time and store it in the dry and consistent temperature basement. This caulk is fully paintable, comes in many different colors, and is as easy to apply and cleanup as any other brand on the market. If you are working on a project that requires you to caulk your joints or corners with a latex caulk, do yourself a favor and spring the few dollars extra for this product. The end result is worth the cost when you aren't having to dig out cracked caulk a short while after you've completed the install. 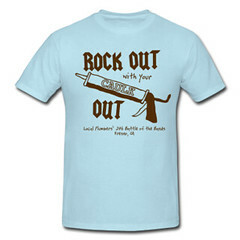 Besides, once you master your caulk ability, and you are confident in your project's long term success, you can always rock one of my favorite, but slightly inappropriate shirts to show everyone just the type of DIYer you are. 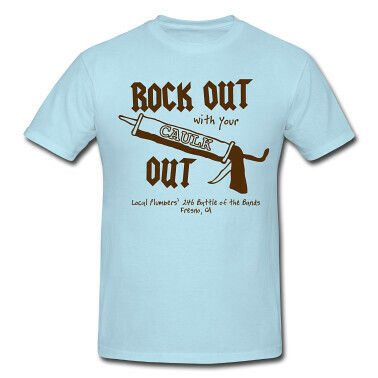 Do you have a preferred brand of caulk that you would be dead in the water without? Maybe another product that costs you a few dollars extra, but you will never go back to the low cost stuff? If so, please share it with us, we'd love to hear. So, hubs and I were at the paint store last weekend getting supplies to reno our kitchen walls. I sent him to get caulk because I couldn't be bothered (I was picking out primer <--very important). He came back with random brand caulk and I was like, "Woah, woah, woah! What's that? Don't you know we need big stretch?!?" So, now you know how your blog helps others. He may not appreciate it now but in two years, when there's still no cracks where we caulked around the doorways, I'll remind him how he really needs to thank you. That's great! You have no idea how happy that makes me. I don't think you'll be disappointed. We've only ever had the Big Stretch fail once, and that was because I spread it paper thin on a gap that was somewhat significant. Totally my fault. 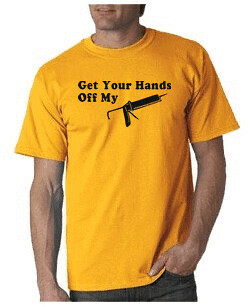 Alex: Those t-shirts are fantastic! There are now a few people on my X-mas list who will be getting the blue one this year. The blue on is absolutely my favorite one. Hysterical.